Adopting an Artwork is a very easy and personal way to support our work. Through this scheme you can help us bring more high quality, original Scottish art to the country’s healthcare environments. Art in Healthcare is truly committed to the important role that art plays in the healing environment but we need your help to properly maintain and build this unique collection for the enjoyment and benefit of the hundreds of thousands of staff, patients and visitors who view it each year. Develop our training programmes for volunteers to further develop their skills to support our aim and outcomes. How do I Adopt an Artwork? For only £3 per month you can adopt your favourite artwork from our collection. Choosing Adopt an Artwork as a gift for someone else is a special and philanthropic way to show you care. To view the artworks available for adoption browse through our collection. 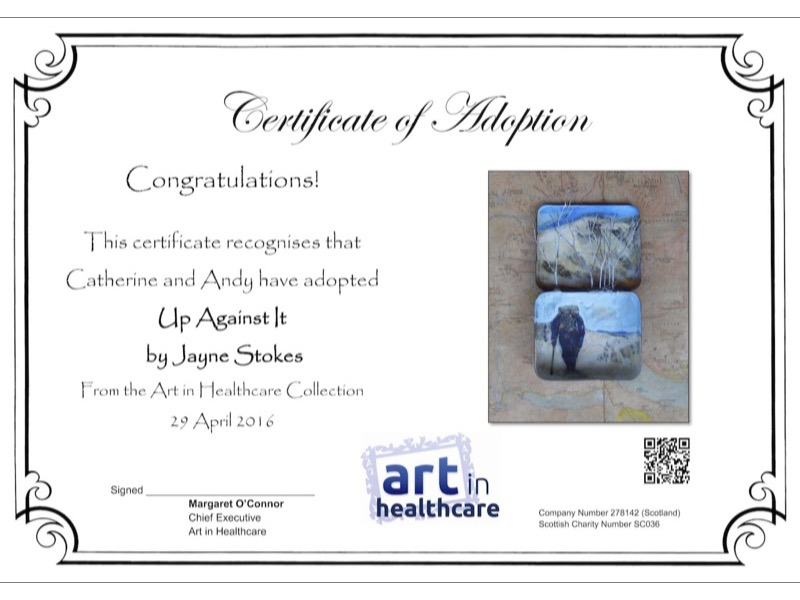 To adopt your chosen artwork now and support our work call us on 0131 555 7638 or you can email us on admin@artinhealthcare.org.uk. Alternatively you can use our contact form by clicking on the button below.